Once, during an ad break in the broadcast of a University of Virginia men’s basketball game, Virginia Sports Radio play-by-play announcer Dave Koehn looked over just in time to see his fellow announcer, Jimmy Miller, stab his pen through his shirt – or so it seemed. Miller is a UVA alumnus and a Final Four veteran – the East Regional MVP of the ’Hoos’ last Final Four run in 1984. He joined Virginia Sports Radio as an analyst two years ago, and still works full-time as founder and CEO of the Charlottesville-based Miller Financial Group. He’s also a magician, specializing in the kind of illusions that Koehn witnessed that day. “I do tricks that pack small, but play big,” said Miller, who will be on hand in Minneapolis Saturday when head coach Tony Bennett and the Cavaliers play their first Final Four game – and UVA’s first since Miller’s own run. As a magician, Miller has performed at dozens of conferences and events, for audiences as small as 20 and as large as 800. Chief among those are two performances at the White House – one for a White House press corps’ holiday party during President Bill Clinton’s administration, and one for an inaugural party for President George W. Bush. There are also impromptu performances, like when he made a handful of salt disappear before Koehn’s eyes at dinner after UVA’s game against Syracuse University this year. He hasn’t shared any trade secrets with his radio partner, though. “He’s a true magician. He won’t tell,” Koehn said. Though he has only been in broadcasting for two years, Miller has a long history with the University. He played for coach Terry Holland; married a fellow UVA grad, Rachel Lloyd Miller; and built a career and a life in Charlottesville. 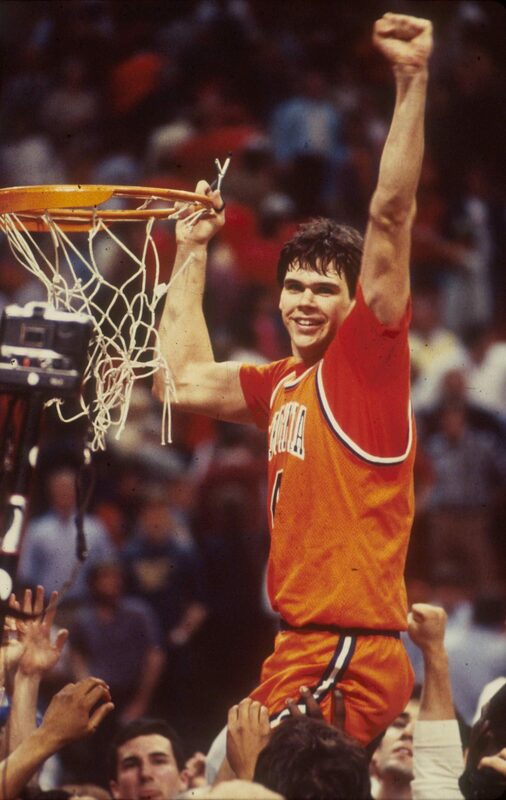 Watching UVA’s team cut down the nets in Louisville after their thrilling Elite Eight victory over Purdue University reminded him of his own Elite Eight victory and Final Four trip 35 years ago. Miller, who grew up in West Virginia, chose UVA because he knew he would have a chance to be both an athlete and a student – and to excel in both. He studied psychology, something that has helped him in finance, in broadcasting and in his career as a magician. He insists that the real trick to being a magician is making the memory of the magic linger – keeping the trick alive in someone’s memory for weeks, months or even years later. In a sense, Miller and Koehn are witnessing a kind of magic right now. UVA’s road to the Final Four has been full of memorable moments, none more magical than Kihei Clark and Mamadi Diakite’s improbable, last-second pass-and-shoot combo that forced overtime against Purdue University in last weekend’s Elite Eight game in Louisville. The shot and subsequent win set off a tidal wave of euphoria among Wahoos everywhere and sent Koehn and Miller to their first Final Four as a broadcasting team. “It’s definitely a bucket list item for every broadcaster,” Koehn said. He’s attended two Final Fours, one as a fan and one as a reporter, but he’s never called one. Miller is also looking forward to his first Final Four on press row. So far, he has loved both the challenge of learning a new field – broadcasting – and the close connection to the University his job affords. “It’s been a great way for me to stay involved with the games and the University, and really a wonderful experience,” Miller said. Koehn, who has called Cavalier games for 11 seasons, said Miller has been a quick study, despite having no prior broadcasting experience. And, Koehn points out, Miller’s win percentage is incredible. UVA has only lost six games since he joined the broadcasting team. “Maybe that’s his greatest magic trick,” Koehn joked. Here’s hoping Miller and the Cavaliers have a little more of that magic left.